Known for its dramatic mountains, world-class skiing and endless hiking opportunities, British Columbia is one of the world’s ultimate adventure playgrounds. But its highlights aren’t limited to the mainland. The largest island off the west coast of North America, Vancouver Island offers a west coast Canadian experience you simply can’t miss. Boarding the ferry from Horseshoe Bay, near Vancouver, for a long weekend exploring BC’s westernmost slice of wilderness, I was itching to reach Tofino, ‘Van’ Island’s famous west coast surf town. But I soon learned there’s much more to see and do on Canada’s 11th-largest island, starting with the port city of Nanaimo itself, where you can set sail on a sunset catamaran cruise around its beautiful harbour, explore the stunning natural cave formations in nearby Horne Lake Caves Provincial Park, and tuck into some of the best fish and chips on the island. 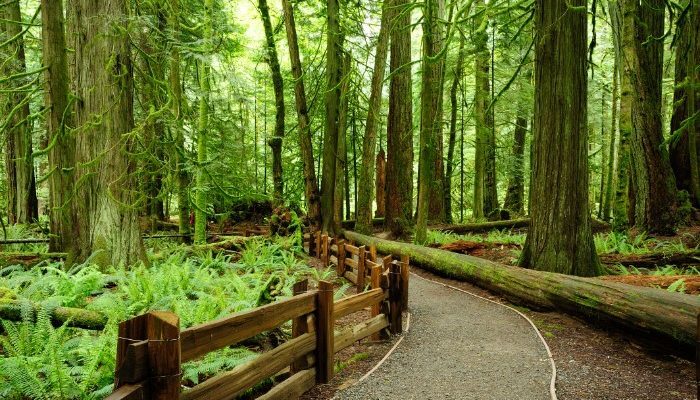 With limited time, however, I pushed on towards Tofino, being sure to take a pit-stop at MacMillan Provincial Park’s Cathedral Grove, a rare remnant of an ancient Douglas fir ecosystem where you can wander among trees up to 800 years old! 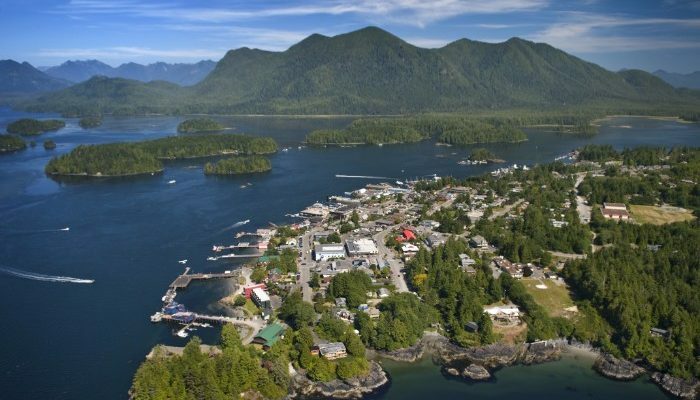 Surrounded by old-growth pine forests and pristine beaches, postcard-perfect Tofino may be getting busier these days, but beyond its hip food trucks, SUP yoga classes and stylish accommodations (such as the beautiful Ocean Village Resort beachfront cabins), its small-town charm remains intact. From natural hot springs to amazing wildlife-watching opportunities, nature remains Tofino’s key attraction – simply hoping to catch my first glimpse of an orca, I got more than I bargained for on an afternoon whale-watching trip with sea otters, sea lions, huge eagles and even a friendly grey whale all kindly posing for my camera. If you’re partial to a spot of kayaking, you can even paddle out into the Clayoquot Sound in search of black bears. Nearby Ucluelet offers similarly extraordinary opportunities for adventure, starting with the famous Wild Pacific Trail created by local trail maverick Jim Martin, which takes in spectacular views of the wild-west coast and the temperate forest that hugs it, though there’s plenty of surfing, kayaking and wildlife-watching to be had here, too. Four hours drive south of Tofino lies Victoria, British Columbia’s elegant capital. It’s easy to spend several days exploring the city’s stately Edwardian architecture – from the iconic Empress Hotel to the historic Parliament Buildings of the inner harbour – and enjoying a taste of the city’s rapidly emerging food scene, but Victoria boasts its own adventure hub status, with such reliable whale-watching to be had in these parts that most local operators offer guaranteed sightings. 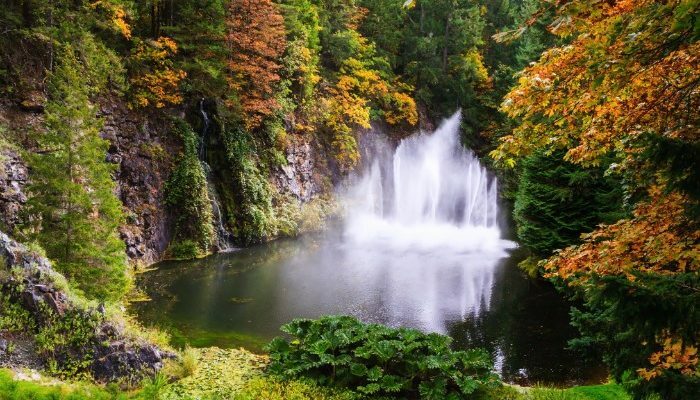 If you’ve got a thing for flowers, don’t miss Butchart Gardens, one of the world’s finest floral show gardens, just half an hour’s drive north of the city, while you’re here. Plenty of walking, cycling and hiking trails start right at the city’s doorstep, but, curious to explore further afield, I scheduled a scenic drive around the island’s rugged southwest coast. The coast road ends at Port Renfrew, the gateway to the West Coast Trail, the famed 75 kilometre hiking path that acted as the survival route for early 20th-century shipwreck victims. This awe-inspiring coastline remains integral to the livelihood of the Nuu-chah-ulth people, descendants of whom work to restore, protect, and present this magical corner of the planet to hikers in their roles as First Nations Guardians of the West Coast Trail. From Port Renfrew, the main road curves across the centre of the island towards Nanaimo, but I couldn’t resist heading back via Victoria for one last craft beer. The city is home to Canada’s first brewpub, after all. And as my ferry zoomed back towards Vancouver later that afternoon, I vowed to return one day to sample more of the delights of this raw, intriguing island. 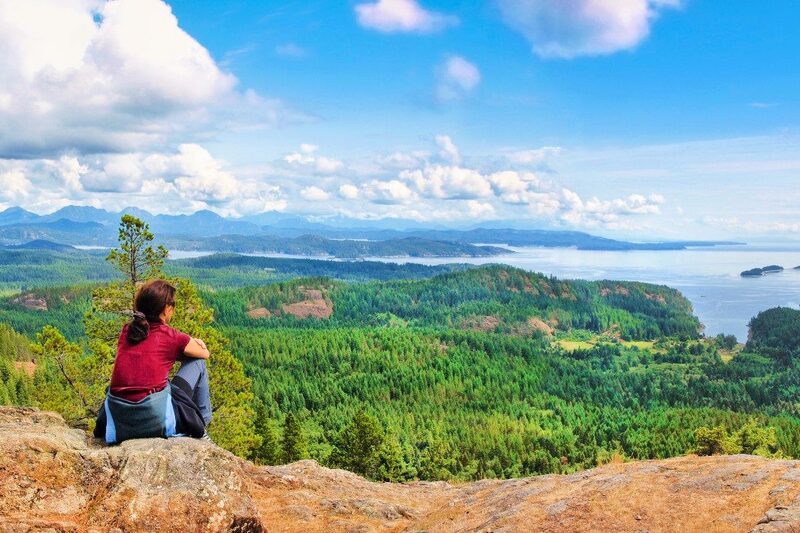 Experience the Best of Vancouver Island on a Peregrine Limited Edition adventure. When my ‘little career break’ morphed into two ski seasons in Canada, followed by a year-long backpacking odyssey through Latin America, I could no longer see myself going back to the features desk on a women’s lifestyle magazine. My ‘office’ now ranges from exotic airports to Bedouin tents, Himalayan teahouses to hip co-working spaces. And I wouldn’t have it any other way. Between writing for travel titles around the globe and trying to adjust to whatever time zone I’m in, I also run a sustainable travel-focused blog, ecotravelist.com.